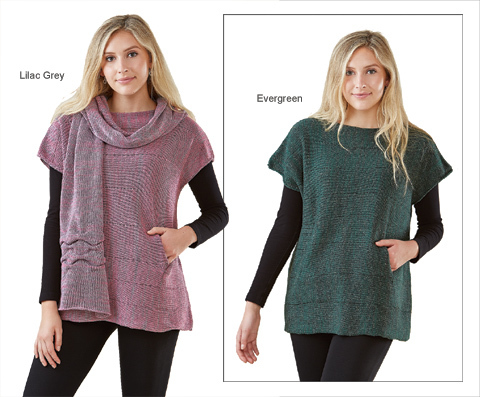 The simple design of this top takes on depth with marled yarns in colors inspired by the Irish countryside. A straightforward rectangle that drapes beautifully, the top is highlighted by knit-in horizontal bands and handwarmer pockets. Made to be worn over a tee. Approx. 24" long. Wool/acrylic/silk/nylon; hand wash. Handmade in Ireland, in a project uniting members of the settled community and Travellers. Also available: coordinating scarf (see item B30103). One size fits most; measures 22" across chest and 27" long (measured flat). In Evergreen or Lilac Grey. I wear a size 16 and was concerned the x-large wouldn't hang loosely as I wanted it to. It is perfect. Great fit, great color. Looks good with and without the scarf. The Traveler shirt I purchased for my wife for Christmas was very well received. She has already worn it for two straight days, using it as an over-sweater for added warmth.